Documenting Sound Of Fallen Trees (And Planes) Researchers at Crater Lake National Park in Oregon have been documenting the park's soundscape. But human-caused noises, like airplanes, are making it harder to hear. 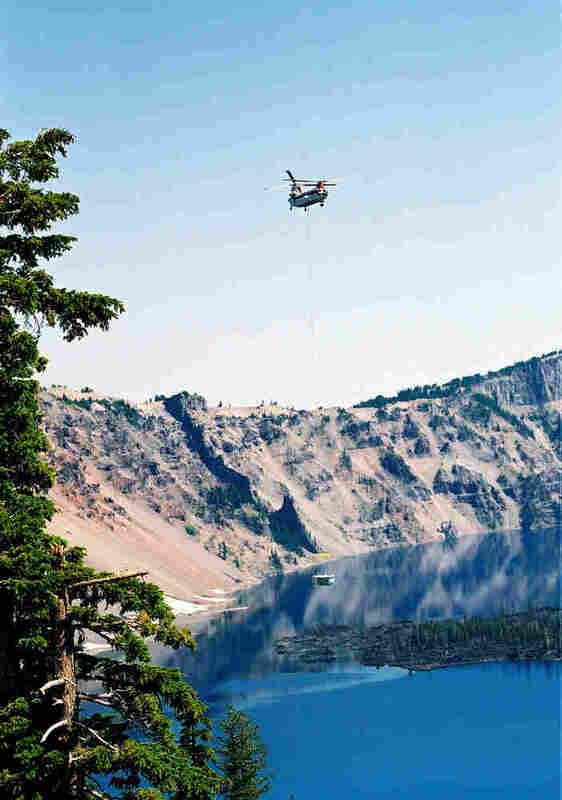 A helicopter ferries a tour boat into Crater Lake at Crater Lake National Park in Oregon. Park management will be evaluating how the noise affects the soundscape and park wildlife. 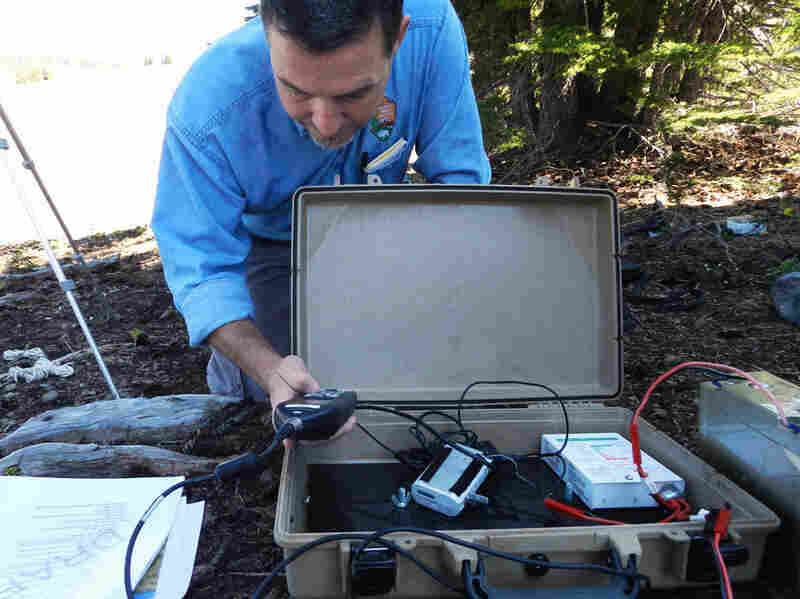 Researchers at Crater Lake National Park in southern Oregon have spent the past two years documenting the park's natural sound. Often, microphones will pick up the sound of falling trees, elks snacking and coyotes howling. In even the most remote parts of the park, however, researchers are also hearing airplane noise 15 percent of the time. Setting up temporary recording stations in 20 different locations, technicians say that there's virtually no place left in America that's untouched by ambient human noise — and that this may be stressful to wildlife. The project is part of a campaign by the national park system to document the invasion of human-caused noise and to preserve a natural quiet in the parks. On a recent day, researcher Scott McFarland is walking around the park to find a place to set up a microphone. He starts hiking away from the main attraction of the park, a deep blue lake in a volcano that blew its top 7,000 years ago. His feet crunch across a field of pumice and ash. "Anything you could possibly think of hearing, we probably have a recording of it. Anything from badgers and porcupines grunting, to the wings of a butterfly," he says. The hardest sounds for McFarland to decipher are branches breaking, or when elk or deer are chewing on the windscreens of the microphone. McFarland decides to set up his recording station in a place where small trees have taken root, and we listen. While it seems quiet to a reporter, McFarland says he heard a propeller aircraft go by. The park is not as quiet as it first seems. Chris Wayne, a scientist who's helping McFarland, says he heard the aircraft, too. "This project kind of ruins your ability to hear silence," Wayne says. "Once you start paying attention, you can always hear the road, wherever you are. Always hear the planes." It may not sound serious, but species like owls need quiet in order to find their prey. "Think about how quiet a mouse would be under the snow. Owls have the ability to hear that," McFarland says. "So just a small increase in noise can really limit the area that they can actually hunt." The problem, McFarland says, is that human noise, like climate change, is a problem the national parks can't just fence out.